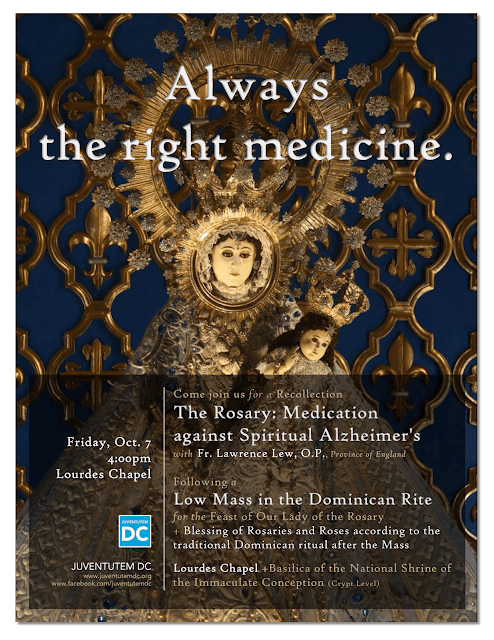 If you are in the vicinity of Washington, D.C. you may be interested in this event organised by ‘Juventutem DC.’ There will be a Low Mass in the Dominican rite at the Lourdes chapel in the Basilica of the National Shrine of the Immaculate Conception, followed by the Dominican blessing of roses and Rosaries – please bring your own if you would like to avail of this sacramental blessing. Following this, there will be a short talk entitled The Rosary: Medication against Spiritual Alzheimer’s. Fr Lawrence Lew, O.P. of the Province of England will deliver the talk and also say the Mass.